An 83-year-old woman fell several feet into the basement of her home after the living room floor collapsed Tuesday morning. 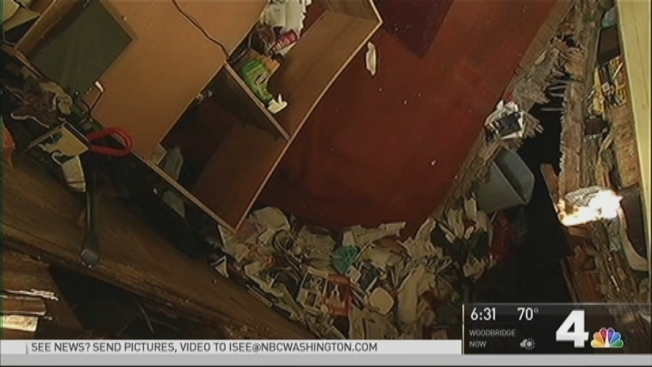 The woman was taking out the trash when the floor of her Oxon Hill, Maryland, home collapsed, sending her into the basement. Neighbors said they worried about the woman because her home was in such disrepair. "I think it's really sad. I think neighbors need to be concerned about neighbors a little bit more," one woman said. The woman happened to be holding her phone when the rotted-out floor gave way, but it took her some time to call for help because she didn't know how to work the phone. "She was down there for about an hour before she reached 911 only because she wasn't extremely familiar with how to operate a cellphone," Prince George's County fire spokesman Mark Brady said. "She kept dialing 911; nothing would happen. She didn't understand she had to hit the 911 and then press send." When she did get through, she told the dispatcher she was trapped. "My living room floor has fallen in and I'm down in the middle of it," she said. The back staircase collapsed when firefighters entered the home to rescue her, but they were able to get her out in time. "She was surrounded by a debris field. They went in, cleared out some of that debris," said Brady. The woman wasn't hurt, but her home is now condemned. Her neighbors are hoping she winds up in a better situation. Brady said the county does offer programs throughout the year that will help residents fix their home.